We’ve been amazed, over and over again, by the creativity of our young Robot Makers! You guys have produced some pretty impressive robots using RERO. We would love to gather all of you in one place to showcase your unique creations but that’s just not possible; you’re from all over the globe! So here’s our solution - we’ll make it possible for everyone to join the fun by running this ONLINE COMPETITION. 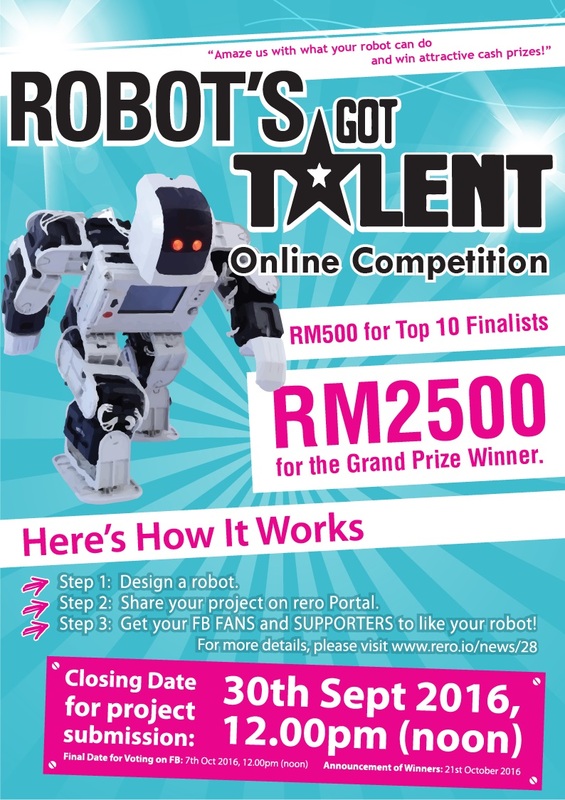 This competition is open to ALL rero Robot Makers. You can enter your personal project OR form a team (max 3 members) to participate in this competition. You may submit multiple entries but each participant is only eligible to win ONE prize. It’s simple - basically you build a rero robot and show the rest of the world what your robot can do! Step 1: Build and program a robot. i. You can design any type of robot you like using rero Robotics Kit. ii. You are encouraged to use 3D-printed and/or LEGO parts and/or other materials to add to the robot’s aesthetic value. However, rero parts must remain as the main building and controlling elements for the robot. iii. NO size and weight limits. i. You will need to register an account first in order to submit a project. Registration is FREE. ii. You will need to share images of your creation, as well as a video to showcase what your robot can do. The video length should not exceed 90 seconds. Step 3: Register your submission by filling this online form. Once accepted, your robot video will be uploaded to rero FB Page. Step 4: Get your FANS and SUPPORTERS to like your robot video. *Guidelines and tips to help you WIN. Read here. 30% will be based on FB users’ response to your robot video, whereby 1 LIKE = 1 point and 1 SHARE = 3 points. Final date for voting on FB is 7th October 2016 at 12.00pm (noon). Accumulated points will be converted to 30%. Points awarded by the Panel of Judges will be converted to 70%. Top 10 Finalists will receive RM500 and the Grand Prize Winner will receive RM2500.